After upgrading to Sitecore 7.5 there where a number of SPEAK dialog’s (select media dialog, insert item link, etc) that would open and show the front page of the website? I eventually tracked it down to they fact that their where a number of duplicated SPEAK items in the core database see the image below and the fact that the solution had some custom code which showed the front page if an item has no renderings defined (not a good idea). I believe that whist upgrading a update package failed and or did not remove the unused items. Delete all the items that have the folder icon, and then all the dialog should work again, of course take a backup of the items before deleting them. 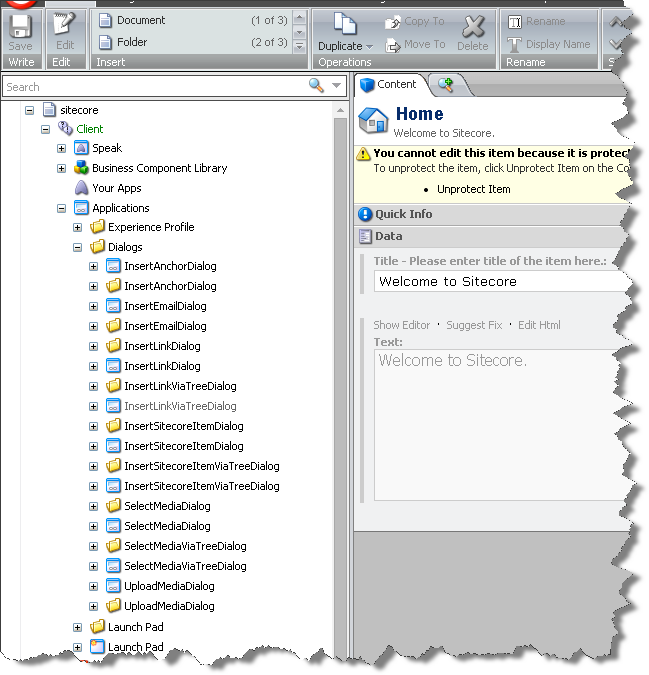 This entry was posted in .Net, Sitecore, Sitecore 7.5, SPEAK and tagged Dialog, Sitecore, Sitecore 7.5, SPEAK on January 27, 2015 by Alan Coates.